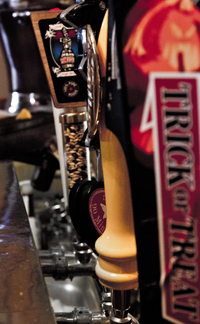 We offer a variety of craft beers, seasonally available and always changing. What’s in our fridge this week? Call for a selection or stop on by! Some of the breweries we have featured in the past include Anderson Valley, Brooklyn Breweries, Yuengling, Dogfish Head, Sly Fox, Great Lakes, Victory, Troegs, Fegley’s, La Chouffe, and many more. Smooth & zesty with just enough sweet-tart zing! A blend of American dessert apples & European bittersweets, perfect year-round! Made with only 4 ingredients without any spices or fruit. It’s the color & scent of summer! Considered as “the classic” among the Belgian season beers! The flavor is vigorous and complex with notes of fresh fruit, spice, leather, and figs.